Earlier topic: Where do you sell your work online? 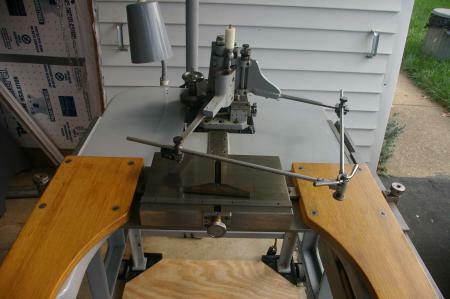 I am looking for any information available on a pantograph-router we have. There is no manufacturer’s name plate on the unit. I know it was used to engrave metal, and it has many adjustments and settings that can be made to the cutter head and the following arms. 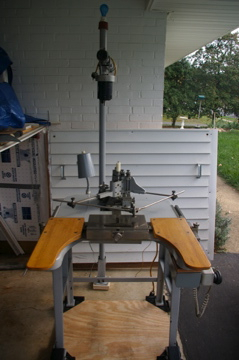 Have you seen a machine like this before, or can you suggest where I might search for information on the machine? Any suggestions would be appreciated. My desire is to see if I can cut replacement wood type characters with it. I don’t know the machine, but very few of the machines made for trophy or name plate engraving had a 1:1 ratio, which is what you would need to engrave replacement type. That is unless you intend to remake patterns for the type as well.